James Button is the ambassador and reserve driver of McLaren. This Formula 1 champion has provided a few tips to Fernando Alonso to ensure he wins the Le Mans 24 Hours race this year. Button will compete against Alonso to achieve one of the prestigious motorsport prizes. Alonso will make his first appearance at the event to fulfill his dream to achieve Triple Crown of motor racing, which includes Le Mans, Indianapolis 500 and Monaco Grand Prix. Button who brilliantly raced with Alonso at McLaren is preparing himself fully to make debut in Le Mans 24 Hours Race. Le Mans race is not easy to win, but there is a good possibility that Button would make it to top. He is ready to fight and the race is indeed going to be quite an exciting one. Jenson Button is all geared up to race with Guy Martin, the TV star on the first day of 2018 Grand Pix. The F1 car will be rebuilt, the first F1 driven by Ayrton Senna, the racing champion before using it against Jenson Button in the month of July at Silverstone. Jenson will compete with Guy with the unusual cars of Formula One the FW08B. It is six wheeled Williams prototype and the same was banned in 1983 by the governing body of motorsport. Guy feels privileged as he gets an opportunity to work with Williams as it brings the monitoring history into his life. Jenson is undoubtedly a world champion, but the real challenge is to tackle the brilliant vehicle Guy has chosen. Jenson Button, who returns to Formula One for a one-off appearance for McLaren at the Monaco Grand Prix, has insisted he is confident in his ability to come back strongly despite not having driven this season’s new specification cars. Button retired at the end of last season after 305 grand prix starts and 17 years of racing in F1. He was retained by McLaren as a reserve driver and drafted in to replace Fernando Alonso when the Spaniard opted to take part in Sunday’s Indianapolis 500 race instead of the grand prix. Button’s last grand prix was at Abu Dhabi in November 2016 when he retired after 12 laps. He also has had no experience with the new Pirelli tyres which are proving more durable and allow drivers to push harder. He was offered an afternoon of testing at Bahrain after the race there but chose not to take part. 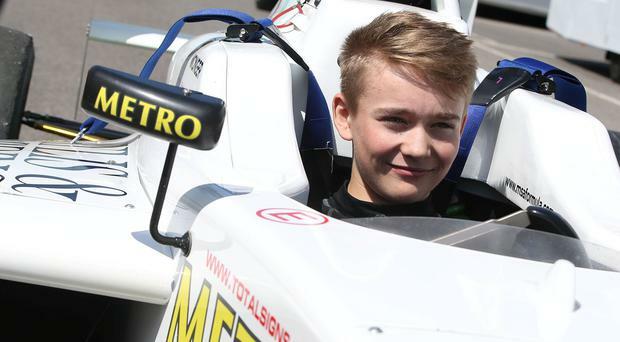 In response to a fundraising appeal made on behalf of Billy Monger, the 17-year old British teenager who was involved in a horrific crash on Sunday, Jenson Button has donated the sum of £15,000. The horrendous car crash which occurred during a British Formula Four race at Donington Park saw Monger plough his car into a stationary car at 120mph caused the teenager to lose both legs. Medics who were in charge of him could n0t save his legs and were forced to carry out amputations to his lower legs. The footage of the car crash was filmed by the on-board camera of Billy’s car and streamed out live on ITV4. For over 90 minutes after the crash, Monger remained trapped in his vehicle before he was finally airlifted to Queen’s Medical Centre in Nottingham. On Wednesday afternoon, a fundraising page for the teenager was established and six hours later, the £260,000 was reached with support from the defending F1 champion Nico Rosberg, Button and Britain’s triple world champion, Lewis Hamilton. As the Australian race in the upcoming weekend of 26th March is on everyone’s minds, most people look back to the 2012 Australian Grand Prix that had proved lucky for Jenson Button. That year he had obtained the title and it is sure that he will try and replicate the win again this season. Indeed, the 2012 season had been one of the highest anticipated events in the world of motor races. The McLaren driver has expressed his opinion that defeating the Mercedes steam in the new season will not be an easy task. He believes that Mercedes will maintain their position as the formula 1 favorite in 2017 and it will take an extraordinary amount of effort for rival to beats them. Button believes that the new formulations being introduced into the formula 1 might even go a long way to play to the team’s strength and consolidate their superiority even more. He believes that the extra drag created by the high down force F1 regulations newly introduced for the 2017 season will probably favor the Mercedes teams. He made the statement at the race of champions being held in Miami where he was set to compete against other Formula 1 stars both past and present from, David Coulthard, Pascal Wehrlein, Felipe Massa, and Vettel Sebastian. Jenson Button, the driver of McLaren was all set to race in the German GP post recovery from a minor eye problem. There was an irritation in the eyes and he was taken for a checkup. Within an hour Button was on his way back to Hockenheim from the hospital. He said there was a foreign body found in his eyes that was cleared and he was all set to drive. Button was in the 8th position in the German Grand Pix that was held on 31st July. This was good news as Button put in his efforts to start from 12th on the grid and moved up ahead in the closing laps. He was 2 places ahead of Fernando Alonso. However, he missed achieving the 1st position due to his eye problem. Button needed 6 laps of data and he managed to achieve it which was perfect. He said that he made a good start and reached almost to the top by making up to the majority of the places. Button was the world champion of Formula One in 2009. This world champion has a driving style that is a class apart. He certainly knows how to show his best performances even in tricky situations.